“As long as we work on the basis of ‘loving the country and loving Hong Kong’, there will always be hope,” said the city’s outgoing Secretary for Security at a dinner in Wanchai’s Grand Hyatt, organised by various pro-Beijing trade unions. 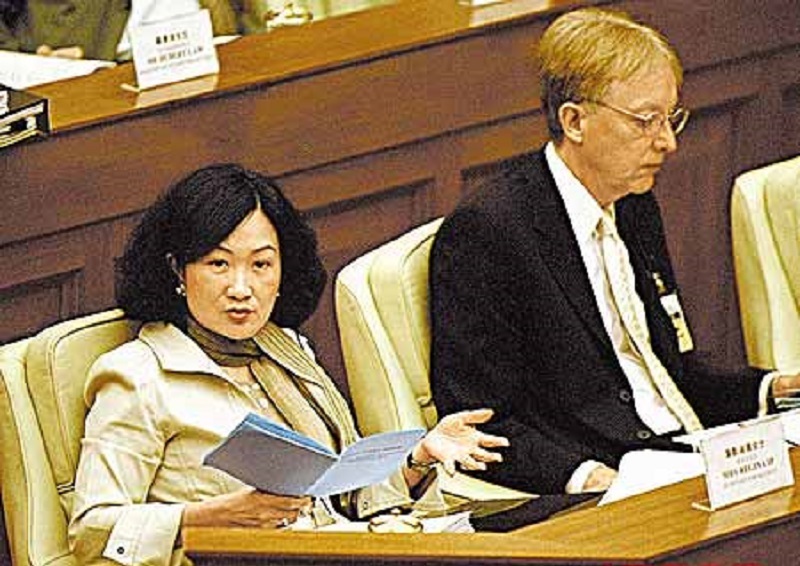 Regina Ip as Secretary for Security in 2003. File photo: GovHK. The speech was not delivered in 2017 – but in the pivotal year of 2003. The city has experienced many changes since, but parallels can be drawn in the tense political atmosphere and the acrimonious battles in the legislature. 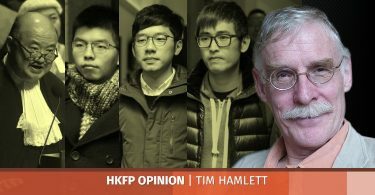 At the heart of the anxiety was the government’s failed bid to enact national security laws – a constitutional duty under Article 23 of the Basic Law – which the pro-democracy camp argued would have destroyed the rights and freedoms of Hongkongers. Today the Article 23 debate has been reignited in the context of the rise of pro-independence sentiments in Hong Kong. While Chief Executive Carrie Lam has said she will not introduce national security laws until socio-economic conditions improve, Beijing official Li Fei warned in a widely-publicised speech in November that their absence created legal loopholes that adversely affected the city. Pro-Beijing figures took Li’s lead in demanding preparations to introduce the laws. Pro-democracy lawmakers and scholars have interpreted moves such as the changes to the legislature’s house rules and the West Kowloon joint checkpoint arrangement as steps to clear constitutional obstacles. What was wrong – or perhaps, what was right – about 2003’s National Security (Legislative Provisions) Bill? The July 1, 2003 protest. File photo: Apple Daily. When drafted in early 1989, the article simply demanded that Hong Kong enact laws to prohibit “treason, secession, sedition, or theft of state secrets.” It did not mention “subversion,” a concept familiar to China but less to the Anglophone common law world, vaguely referring to overthrowing or undermining the established order. The draft also did not expressly protect the central authorities. “Foreign forces” were not a concern. Then the city exploded in protests against the Tiananmen Square Massacre, and local activists rescued Beijing’s student leaders from persecution. In response, the Basic Law Drafting Committee introduced an expanded version of the article, which remains to the present day. But for some critics, the question raised by Article 23 is not what to enact, but whether to enact new laws at all. As a British colony, Hong Kong already had very broad definitions of treason and sedition in the Crimes Ordinance. 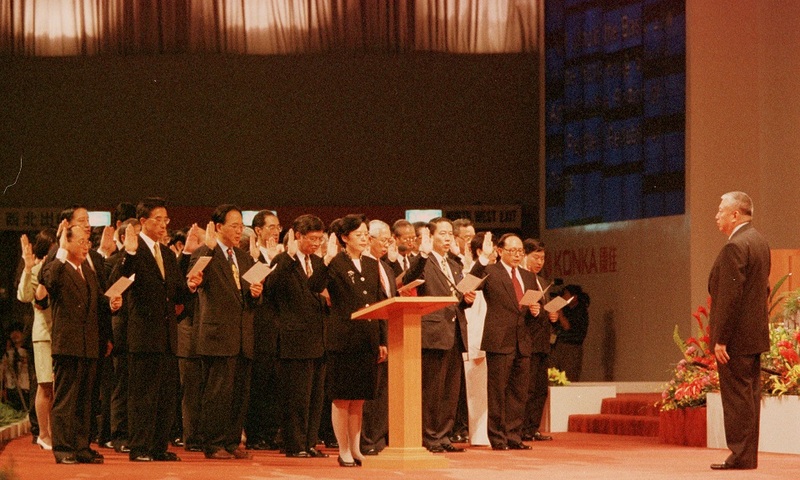 The final meeting of the colonial Legislative Council in June 1997. File photo: GovHK. 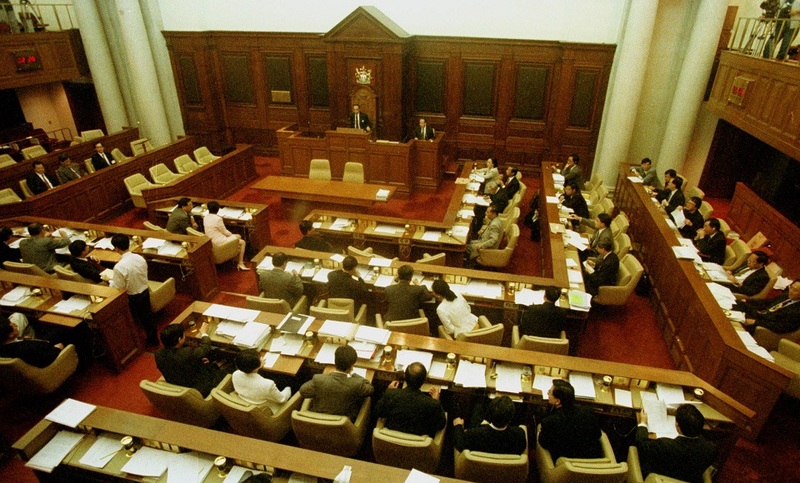 In June 1997, the colonial Legislative Council – which lost its legislative status after the handover – enacted the Official Secrets Ordinance, banning certain unauthorised disclosures of information. 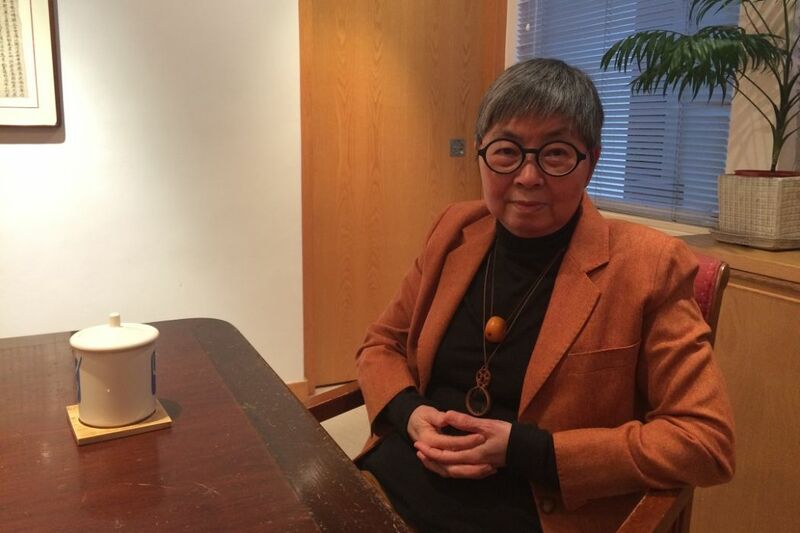 “[It was passed] with the agreement of the Sino-British Joint Liaison Group that this would take care of the theft of official secrets… in Article 23,” veteran barrister Margaret Ng told HKFP. The same month, the Shenzhen-based Provisional Legislative Council – which transitioned to become Hong Kong’s official legislature after the handover – amended the Societies Ordinance. The amendments banned political groups from having ties with their overseas or Taiwanese counterparts. 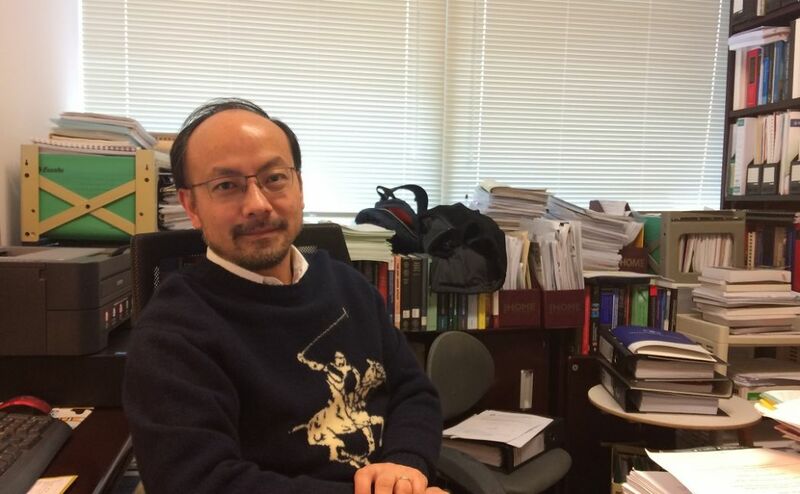 With these existing laws in mind, scholars such as Hong Kong University professor Johannes Chan are sceptical as to whether – by asking Hong Kong to “enact laws” – Article 23 really means that the government has to table a fresh bill. “We shouldn’t say that Hong Kong has failed to fulfil its constitutional duty under Article 23. We should ask whether existing laws already do so,” Chan told a conference last March. The Provisional Legislative Council. Photo: GovHK. A possible counterargument is that the existing law on treason and sedition is so broad that it is unconstitutional. “It was colonial legislation, it was very draconian, and if it was applied… much of it would have become obsolete because of the Bill of Rights Ordinance,” said Ng. This ordinance was Hong Kong’s landmark 1991 law adopting international human rights standards. Only two treason trials have ever been documented in Hong Kong’s law reports: those of local resident Lai Kit (1946) and Japanese-Canadian Kanao Inouye (1947). Both were involved in abuses while serving Japanese forces in Hong Kong during the Second World War. Ng was the legal constituency lawmaker at the time of the Article 23 saga. To her, the government’s announcement to begin public consultation for a proposed national security bill came suddenly. Then-chief executive Tung Chee-hwa speaking to District Councils about the Article 23 proposal in January 2003. Photo: GovHK. A month prior to the announcement, the Legislative Council had enacted the United Nations (Anti-Terrorism Measures) Ordinance, a law that enhanced measures against terrorist acts and financing after the September 11 attacks. The bill’s original provisions were criticised for their breadth; one proposal even gave the chief executive the power to designate anyone as a terrorist upon reasonable grounds. The government responded with concessions, such that the chief executive could only designate people already on a United Nations sanction list as terrorists. In July 2002, less than three months after its introduction, the legislature passed the anti-terrorism bill. Margaret Ng. Photo: Elson Tong/HKFP. Then came the national security bill. The Hong Kong government sought the views of British human rights lawyer David Pannick, and even published a 76-page consultation document. But the latter was again criticised as vague. But like it did for the anti-terrorism law, the government tabled a bill directly to the legislature – a “blue bill” – in February 2003. The government had repeated its methods. 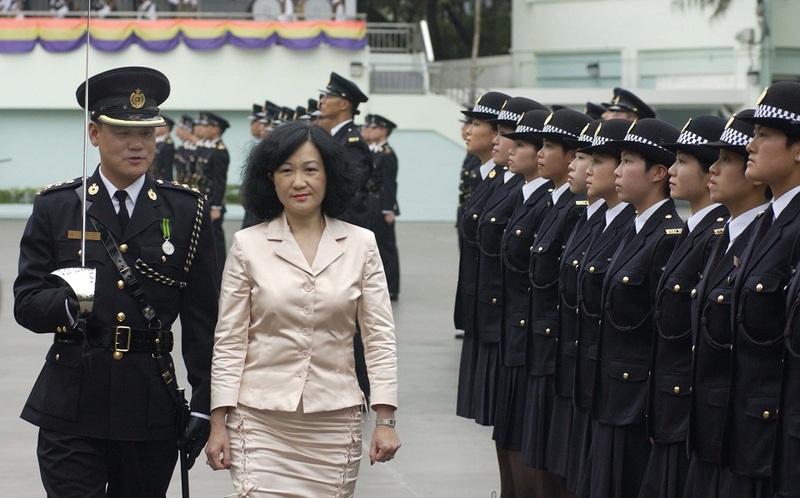 At the time, Regina Ip and Elsie Leung respectively led the Security Bureau and the Department of Justice. But Hong Kong University professor and prosecutor Simon Young told HKFP that colonial-era British officials, like solicitor-general Robert Allcock, were more involved as hands-on drafters for the bill. Young says that overseas anti-terrorism laws were likely greater influences on the content of the bill than mainland legal concepts, which were mentioned only sporadically in the consultation document. 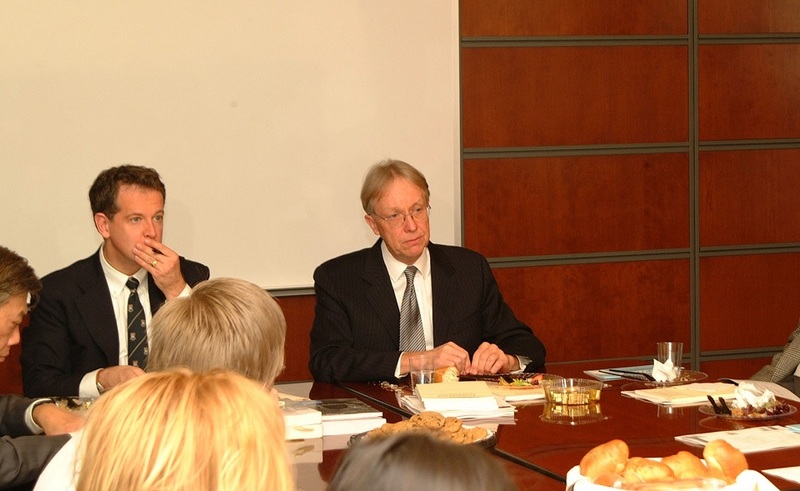 Robert Allcock (centre) in 2003. Photo: GovHK. But the bill immediately attracted criticism from legal experts for a lack of clarity in specifying what acts are criminal, and whether they must be conducted with intention or some state of mind. “Looking at the proposed legislation, you will not be able to find out precisely what would get you into trouble, and what would not,” said Ng. (c) assists any public enemy at war with the People’s Republic of China by doing any act with intent to prejudice the position of the People’s Republic of China in the war. by using force or serious criminal means that seriously endangers the stability of the People’s Republic of China or by engaging in war. (b) incites others to engage, in Hong Kong or elsewhere, in violent public disorder that would seriously endanger the stability of the People’s Republic of China. with intent to incite others, by means of the publication, to commit an offence under section 2 (treason), 2A (subversion) or 2B (secession) is guilty of an offence. According to Young, several other proposals in the national security bill – such as the granting of extra powers to the police – were not even Article 23 requirements. 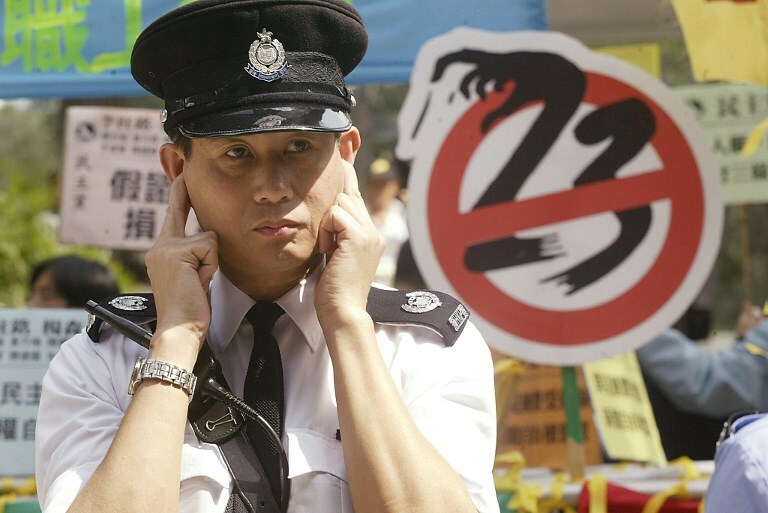 A police officer puts his fingers in his ears to protect himself against a noisy protest outside the Legislative Council building for the first hearing of the controversial Article 23 anti-subversion law in Hong Kong, 26 February 2003. File photo: Peter Parks/AFP. (f) may remove by force any person or thing obstructing him in the exercise of any power conferred by this subsection. A proposal to ban organisations “subordinate” to those banned in mainland China was criticised as targeting the Falun Gong spiritual group. Another proposal to expand the Official Secrets Ordinance was met with strong objections from the Journalists’ Association. (1) The Secretary for Security may by order proscribe any local organisation to which this section applies if he reasonably believes that the proscription is necessary in the interests of national security and is proportionate for such purpose. […] (c) which is subordinate to a mainland organisation the operation of which has been prohibited on the ground of protecting the security of the People’s Republic of China, as officially proclaimed by means of an open decree, by the Central Authorities under the law of the People’s Republic of China. (b) that is or has been in his possession by virtue of his position as a public servant or government contractor. 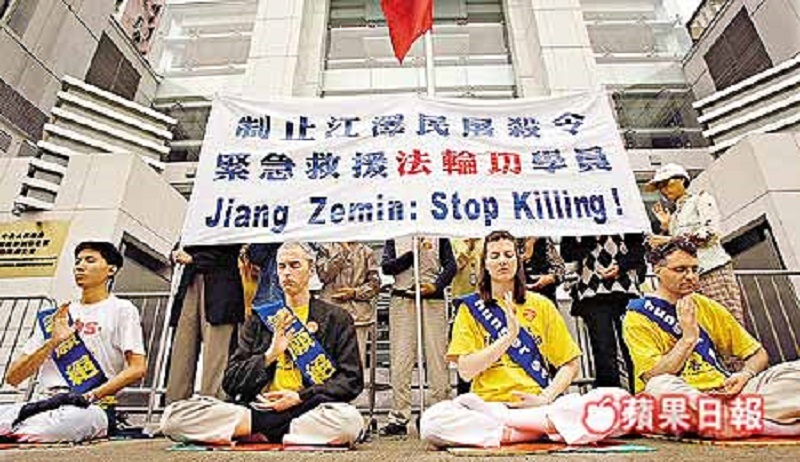 A Falun Gong protest outside the Liaison Office in 2002. Photo: Apple Daily. 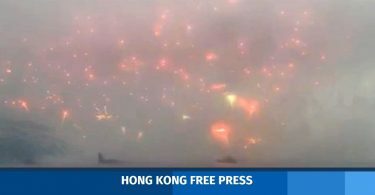 Over the course of spring, the bill was debated in Bills Committee hearings that sometimes descended into quarrels involving Regina Ip and the pro-democracy camp. “We proposed our amendments, but it was not only legislators, but civil society… the press, religious organisations, the Bar,” said Ng. Beginning in June, the government put forward five rounds of amendments that diminished the severity of the bill’s provisions. Sedition could only be committed with intent. The extra police powers were removed. The government could still ban organisations for national security reasons – but not just because they are banned in China. You could defend yourself against charges of exposing secrets by claiming there was public interest in doing so. Regina Ip in the legislature in 2003. Photo: Apple Daily. The dramatic fall of the national security bill is well-known. 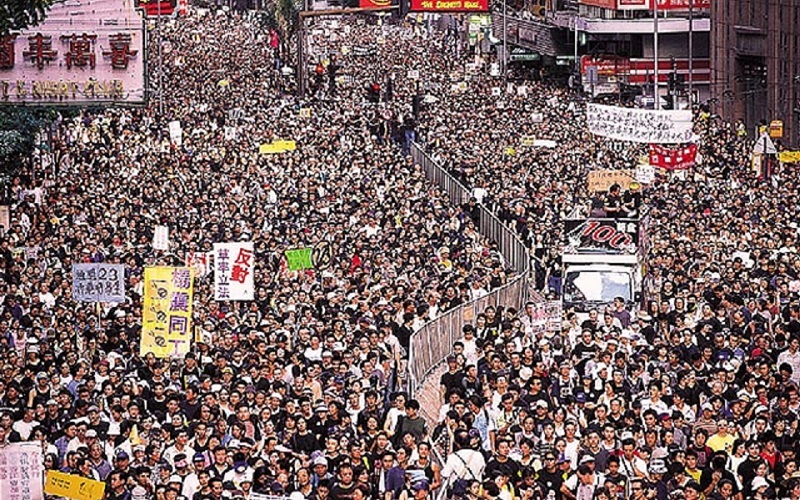 500,000 Hongkongers took to the streets to protest on the sixth anniversary of the transfer of sovereignty. Buses and trams ground to a halt among the crowds. The first demonstrators arrived at government headquarters at 4pm; the last at 10pm. The Liberal Party then withdrew its support for the bill. The government deferred debate of the bill, and later removed it from the legislature altogether. Ip resigned. 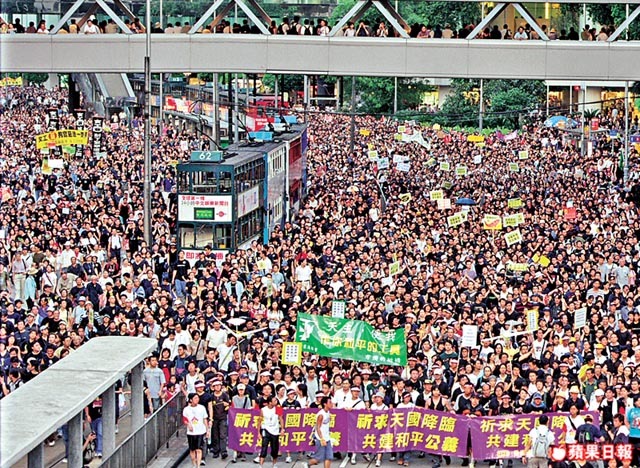 The July 1, 2003 protest. Photo: Apple Daily. Given that the national security bill failed, Hong Kong’s current laws remain curiously archaic. (f) conspires with any other person to do anything mentioned in paragraph (a) or (c). Simon Young. Photo: HKFP/Elson Tong. But 15 years later, Beijing’s national security frontiers may have shifted from the Falun Gong to new threats, such as the Hong Kong independence movement. As a much more powerful and confident regime, its strategies for managing the city may also be changing. In 2016, it interpreted the Basic Law to effectively disqualify six newly-elected opposition legislators. Following a meeting with President Xi Jinping in December, Chief Executive Carrie Lam told reporters that it would be difficult to begin Article 23 legislation this year. In January’s legislative question-and-answer session, she suggested that her priorities this year would be to pass the West Kowloon joint checkpoint arrangement and a national anthem law. But if, and when the time comes, how will Hong Kong cope with a new national security bill? See Part II: Old wine in new bottles for Hong Kong’s national security debate.